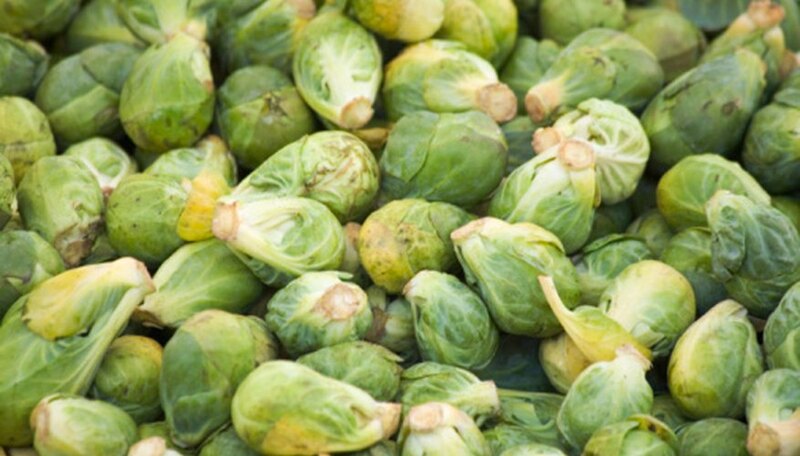 Brussels sprout plants are hardy vegetables that are members of the cabbage family. Their small, round, leafy vegetables look very similar to tiny cabbage heads. Although planted during the summer months, Brussels sprout plants are cool-weather plants that do not produce any sprouts until the fall or winter. Although severe pruning is not required, lightly pruning Brussels sprout plants will actually encourage more vigorous growth and additional sprout development. Wait until you see at least one sprout develop on the plant and then prune off the lowest six to eight leaves using hand pruners. Make the cut as close to the main vertical stem as possible without damaging it with the blade. Trim off two to three additional lower leaves each week throughout the remainder of the growing season using the same technique. Keep several large, healthy upper leaves, which feed the plant. Wait until three weeks before you are planning to harvest the sprouts. Stop trimming off the lower leaves of the plant and instead cut 1 to 2-inches off of the uppermost vertical stalk using the hand pruners. Make the cut straight across the stem, preferably just above a leaf. Kimberly Johnson is a freelance writer whose articles have appeared in various online publications including eHow, Suite101 and Examiner. She has a degree in journalism from the University of Georgia and began writing professionally in 2001. Are Chinese Palm Plants Poisonous to Cats? Do Pine Trees Have a Taproot?